+ To qualify as a "low-access community," at least 500 people and/or at least 33 percent of the census tract's population must reside more than one mile from a supermarket or large grocery store (for rural census tracts, the distance is more than 10 miles). The USDA includes an economic angle in the definition, which makes sense. But its map doesn't address the whole picture -- and in, some cases, maybe even gives the wrong impression. 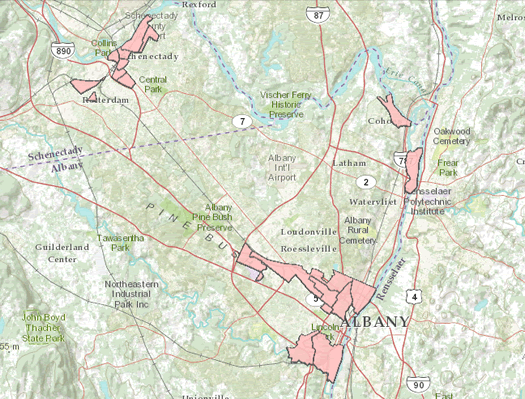 For example: that census tract running along Central Ave in Albany may qualify as a food desert by that definition, but it includes (or borders) two (soon to be three) large supermarkets and the Honest Weight Food Co-op. So we made our own map by pulling the locations of supermarkets in the Capital Region and drawing a radius of one mile around each one. The map is embedded in large format at the top of this page -- scroll all the way up. You can click on each circle the see which supermarket it represents. There are certainly limitations to this map (addressed below), but it does give a reasonably good sense of how Capital Region supermarkets are distributed geographically. And when compared to the USDA food desert map, it highlights that the Central Ave corridor in Albany isn't lacking for supermarket access. But it also matches up with some of the the other deserts identified: specifically, north Albany and a large stretch of Schenectady. + Wow, there are a lot of supermarkets in the Capital Region. And they tend to cluster around each other. That probably shouldn't be surprising -- if you're going to build a supermarket, you want it in a high traffic area along a major corridor. There are only so many of those spots. + Price Chopper takes a lot of flack from people around here, but it probably doesn't get enough credit for is its willingness to keep small supermarkets open in areas that wouldn't otherwise be served by them. For example: the Delaware Ave Chopper in Albany. Sure, it's not the nicest store -- but if it closed, a large part of Albany that includes many low-income people would no longer be within a 1-mile radius of a supermarket. The same goes for other spots, too: Price Chopper operates stores in areas of Watervliet and Menands that would otherwise be devoid of supermarkets. + Conversely, Hannaford is sort of like the exurban Price Chopper. It operates supermarkets in spots toward the edge of the Capital Region's core that otherwise wouldn't have have close access to a store -- including spots such as Vorheesville, West Sand Lake, Ravena (through Shop N Save), and Schaghticoke. + Stores included in this survey: Price Chopper, Hannaford, Walmart, ShopRite, Aldi, Save-A-Lot, Honest Weight, Niskayuna Co-op, Greulich's. It's very possible we missed some of the independent stores. And we didn't include the Targets that now offer groceries. We also did not include smaller places that offer groceries, like a Cardona's. + We only included stores in the core counties of the Capital Region, so the makes the edges look especially bare because stores in the nearby counties aren't represented. + We didn't differentiate between the really huge, posh supermarkets and the smaller, old-school kind. + Another significant limitation: the map doesn't take into account the fact that almost everyone toward the edge of the core probably has a car. Drawing a 1-mile radius around stores in those sorts of areas probably only has limited value. + The map also doesn't take into account the "transportation geography" of the area. Sure, a store may be more than a mile from someone, but if there's good access via public transit, that's less of an issue. + Here's the link to the listing and geo data. + Of course, we always welcome corrections or suggestions. Great piece, hopefully it continues the discussion. The map also doesn't take into account the "transportation geography" of the area. Sure, a store may be more than a mile from someone, but if there's good access via public transit, that's less of an issue. And vice-versa. It's not really practical for someone (besides Jesus) in the south end to walk across the river to Aldi's. And realistic foot access to the Delaware Ave chopper probably doesn't extend quite that far north and east. It's really, really difficult for those of us dependent on our cars to understand how hard it is to do otherwise routine things like get groceries on foot. We didn't differentiate between the really huge, posh supermarkets and the smaller, old-school kind. Or more importantly selection. I am really happy the Delaware Save-A-Lot is there, but show of hands, who's been inside? The phrase "better than nothing" was invented for it. Reason 678 why I love AOA: posts just like this one. so where are you suggesting the Wegmans and Whole Foods go? As someone who had to get the household groceries without the household car, and had to do it by bus on occasion, I can attest to how difficult it can be. Most of those grocery stores on the Central Ave corridor are served by packed busses. Where are people supposed to put their groceries when there are baby buggies and bodies in the way? Luckily I could do quick trips on foot to a nearby store but substantial trips had to be done by car. @B: Good points both about pedestrian access and what's available at the stores. @JR: Heh. Market saturation is an issue, especially now that ShopRite is investing heavily here. The pie's not getting bigger very quickly -- so anyone new to the market will have take market share from everyone else who's already here. @Katie: You know, somewhere on along Free-90 might not be such a bad idea. But I bet the population of the region slants heavily toward the northwest. I'm always surprised by how little development there is in that part of Rensselaer County. Your point about the little Price Choppers in urban neighborhoods is a good one. Most US chains that have smaller stores tend to be high end (Whole Foods, Trader Joes). We're lucky that we have an affordable option that people can walk to. I just wish they'd take better care of the small urban stores. I wonder what their profitability is like relative to the bigger suburban stores, and if the lack of investment in the urban stores has an economic basis. This is an excellent post, with many good observations. A minor quibble: What about the Hannaford in South Glens Falls? SGF is in Saratoga County. About those unserved areas. There is a program that has grant money and financing available for people willing to put grocery stores in low income neighborhoods. I've spoken with this people from this program and Albany is one of their target cities. However, when I spoke with them they said no one from the city had talked to them. Why are none of our local elected leaders pursuing this? New jobs and a way to improve downtown and attract more residential to downtown. What's not to like? And free money to do it? The need is there, the money is there. We just need some local leadership interested in building livable urban communities instead of convention centers. Unfortunately, that is the key missing ingredient. If you think about trying to feed a family, with a limited amount of time, and then think about how many groceries you can carry for a mile, and then think about trying to hold the hand of your toddler so she doesn't wander off while you haul those groceries home, it becomes really apparent that programs like CDCG's Veggie Mobile (http://www.cdcg.org/VeggieMobile.html) and Healthy Convenience Store Program are absolutely vital additions to this map. Another thing to consider is the quality of the food at each store and whether or not they accept food stamps. Take a look at the selection and quality of food in the stores accessible to the South End- Save-a-lot and the Delaware Ave Price Chopper. Then walk around any grocery store in Latham and Niskayuna and tell me that poor people aren't getting thoroughly screwed over here in Albany. All the Hannaford/ Price Choppers should take EBT, as well as most food stores in low income neighborhoods. But surprisingly, there are still some major supermarkets in the area (ahem, Fresh Market) that don't accept EBT, and when asked about it the manager expressed no desire or need to start. So not only are the stores with the best quality food the hardest to get to, they actively discourage low-income people from shopping there.